A private graveside service for Madonna Kathleen Healy, 74, West Plains, Missouri, will be held at Howell Memorial Park Cemetery, under the direction of Robertson-Drago Funeral Home. Mrs. Healy passed away at 11:47 a.m., Tuesday, April 9, 2019 at her home. She was born June 23, 1944, at Chicago, Illinois, to Harold Ernest Mickey, Sr. and Faith Lillian Paulsen Mickey. On September 21, 1963, she was married at Palos Heights, Illinois, to Michael Healy. Madonna loved her family and spending time with her grandchildren; she also enjoyed sewing and crafts. Mrs. Healy was a member of St. Paul Lutheran Church. 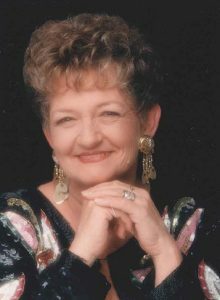 She is survived by her husband, Michael Healy; two daughters, Kim Pond and husband, Terry and Karrie Henderson; five grandchildren, Tiffany Busbey and husband, Justin, Brandi Mills and husband, George, Tyler Pond and wife, Monique, Lacee Reno and husband, Rickey and Levi Henderson and fiancé, Tiffani; nine great-grandchildren and one on the way, Madi, Gunnar, Olivia, Camden, Ella, Emily, Kayden, Jeremie and Ryin; her mother, Faith Mickey; and several nieces and nephews. Her father and two brothers, Harold Mickey, Jr. and Mike Mickey, preceded her in death. Memorial contributions may be made to St. Jude’s Children’s Research Hospital and may be left at Robertson-Drago Funeral Home. Kim, Karrie and Family, I am so sorry to hear about your moms passing. Hold close to your heart all your special memories you have together. I get comfort from cardinal birds since dad passed away. There is a saying that when you see a cardinal bird it is a visitor from Heaven! Hope you can find peace and comfort from cardinal birds too!!! Love and hugs to you and your family!!! If you need anything, please let me know. So very sorry to hear this. Prayers for your family. It was a sincere pleasure to be part of Madonna’s care team. Thank you for welcoming me into your home. Carrie and Kim, my heart hurts for you. Having lost my own Mother, I feel your pain. Knowing she is out of pain may help your healing. It makes me smile to imagine the reunion in Heaven with loved ones that have gone before. Knowing we will have loved ones to greet us heals my soul. May the memories you have bring you peace.